Pan-fried duck breast served with braised cabbage, celeriac and carrot and a seasonal berry coulis. Roasted duck breast served with baby potatoes and spring onions, garlic roasted courgettes and a pink peppercorn sauce. A beautiful seasonal meal of roast duck, berries, cabbage a l'ancienne and foie gras. Red Curry is one of Thailand's greatest exports and duck is the ideal accompaniment. In this class you will learn to balance a number of flavours and spices as you make a red curry paste from scratch. A quick and easy curry to put together and a definite show stopper for friends and family. All ingredients in this recipe can be found in your local shops. A great winter dish, the marriage of duck and spiced plums is a sure winner! Duck breast with a spiced honey glaze served with a potato, confit duck and foie gras stack and a red wine and balsamic vinegar reduction. 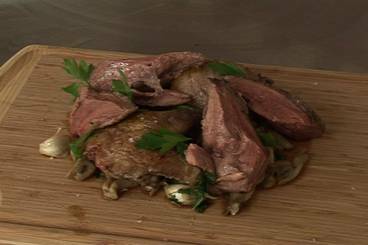 Oven roasted duck served on a bed of mushrooms, shallots and garlic. 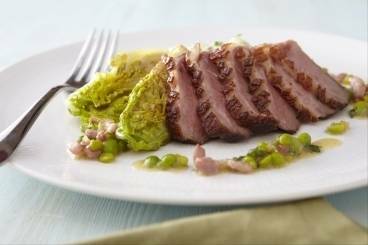 Roasted duck breast served on a bed of braised baby gem with buttery peas and herb pommes puree. 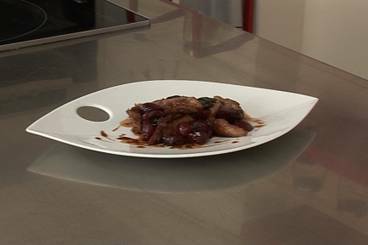 Choice slices of duck breast served with shallots and roast cherries.